NORTH ATTLEBORO, Mass. – North Attleboro had its best offensive performance of the season on Wednesday night to beat Weston on the road and earn its first win of the season. The Rocketeers carried that momentum over to Friday night, when it hosted Davenport division rival Sharon in the Pickering Gym, and came through with their best defensive effort. North limited the Eagles to no more than 10 points in any quarter, went on a 22-2 run between the first and second quarters, and pulled away late to win 57-34. It was the lowest point total that North had allowed this season. Sharon got off to a good start, despite missing leading scorer Emma Eberhardt, who was injured in the loss to Holliston earlier this week. Kaitlyn Wallace (nine points and six rebounds) buried back-to-back threes to give the Eagles an early lead, but midway through the quarter the North offense finally clicked into gear. Amanda Kaiser (game-high 18 points, including four three-pointers) nailed a triple to cut the lead to one and Julia Feid (14 points and six rebounds) got a layup in transition off a great pass by Lydia Santos to give North its first lead. Telishya Herbert (team-high 13 points and eight boards) got a layup off an Evanjuline Elisma assist to make it 8-7, but that was the last time Sharon would be in front. Siobhan Weir scored on a layup, Feid nailed a pull-up jumper, and then Weir added a second bucket to make it 13-8 at the end of the first quarter. The Rocketeers didn’t let up in the second, scoring the first 11 points, including five from Kaiser, four from Feid, and a score by Emma Noreck on an offensive rebound. The Eagles tried to hang around with a 7-2 run to close the half down 26-15. Elisma scored all six of her points in that stretch, scoring a traditional three-point play off a Leah Fandel assist, and then knocking down a three off an Ally Brown feed. 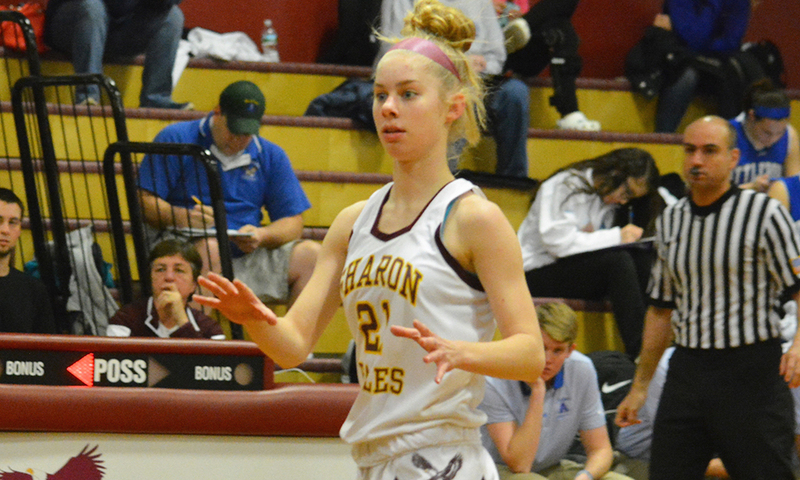 Sharon were slow coming out of the locker room at halftime, walking out just as the buzzer sounded, but the Eagles managed their best offensive quarter of the game, scoring 10 points in the third. Herbert had four points in the quarter and Trinity Payne (eight rebounds) drove to the basket for a three-point play. Every time it looked like Sharon might get back into the game, North answered. Olivia Forbes hit a three off a Feid assist to make it a 12-point lead and then Kaiser drilled a three off a Feid offensive rebound and kick out that extended the Rocketeers’ lead back to double digits (34-22). Kaiser hit her fourth three of the night to make it a 14-point game. North led by 12 heading into the final quarter and a Herbert layup cut it to 10 right away, but the Rocketeers went on a 9-0 run. Feid scored on the break, Forbes hit a jumper, and Weir (seven points) buried another shot from beyond the arc. Kaiser added a pair of layups when she leaked out in transition and Regan Fein scored all five of her points in the fourth to help the Rocketeers extend the lead. 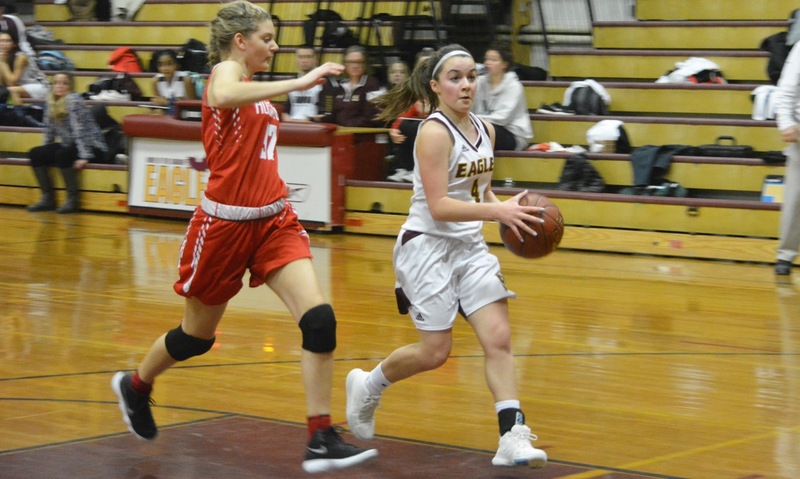 Sharon (3-5) will try to end its two-game losing streak when it takes on Taunton on Tuesday, in a game that is already looking important for the Eagles to make the tournament. SHARON, Mass. – With only seven seconds remaining in overtime, Holliston guard Grace Dzindolet went to the line to try and put the Panthers back in front. The senior hit the first, but her second bounced off the rim and was rebounded by Evanjuline Elisma. The Sharon junior took off like a flash, racing up court with an opportunity to win the game for the Eagles. Elisma went straight at the basket. There was contact between Elisma and a Holliston defender but there was no whistle, only the final horn putting an end to a thriller that the Panthers pulled out 56-55 to sweep the season series by a combined four points. The Eagles seemed to be playing catch-up right from the opening quarter. Sophomore Allyson Brown (seven points) drilled a three to put Sharon ahead 10-8 in the first, but Holliston went on a 7-2 run to close out the quarter with the lead. Dzindolet scored seven of her team-high 14 points in the first. Holliston extended the lead in the second, as Sharon was held to just one made field goal for the first six minutes of the quarter. Behind four points from Brooke Geoffroy (12 points and 16 rebounds), the Panthers led 25-16 and seemed on the verge of breaking the game open. It could have been much closer, but for Sharon’s struggles at the free throw line. The Eagles shot just 6-of-14 at the line in the second and 10-for-24 for the game. Still, as the half was winding down, the Eagles were still in it. 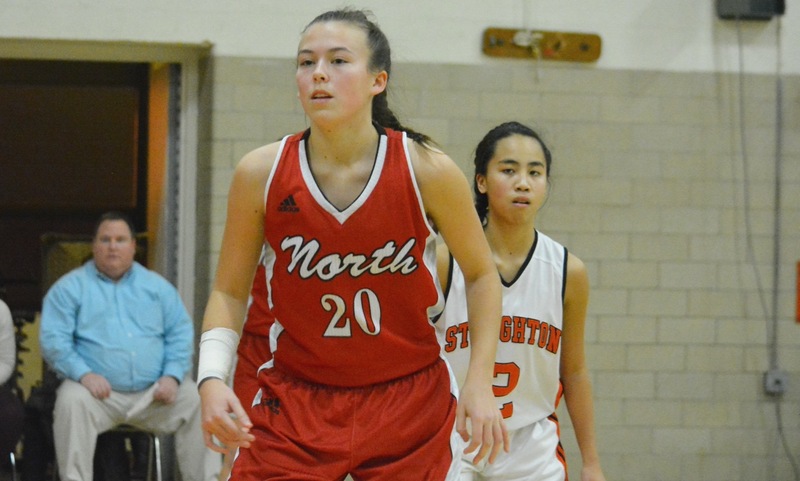 Miranda Cheung (seven points), the only senior on the Sharon roster, got a steal and a layup, which was followed by a traditional three-point play by Emma Eberhardt (15 points and 15 rebounds). Sharon trailed by just one at halftime, but Holliston was able to push the lead to five at several points of the third quarter. Geoffroy had six in the quarter, but Eberhardt scored seven points and Kaitlyn Wallace drilled a three to keep it a two-point game with eight minutes left. Wallace and Eberhardt went back-to-back on drives to the hoop to tie the game at 39-39 in the fourth quarter and then Elisma kicked out to Telishya Herbert to knock down a jumper from just inside the three-point line to give the Eagles their first lead since it was 10-8 in the first. 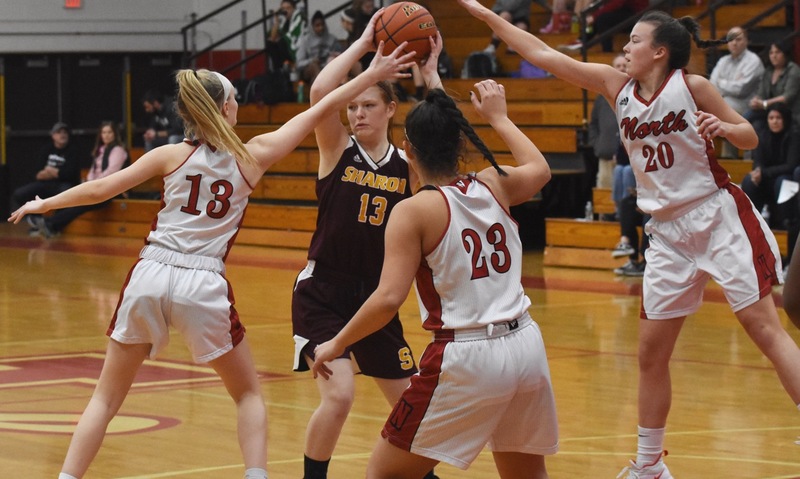 The lead was short-lived, as the Panthers proceeded to go an 8-0 run and seemed to have the game in control after Tess Powers completed a four-point play. Sharon answered. Brown picked up a steal and went the length of the court for a basket and then, off another Brown steal, Elisma got free in transition to make it 47-45. Cheung battled for a loose ball underneath, grabbed an offensive rebound, and went right up to score and tie the game. Sharon got it back with 27 seconds left and the chance to win it with the final shot, but the Eagles turned it over. Dzindolet thought she had the game-winner on the break only for Wallace to block the shot and keep Sharon alive. Geoffroy put the Panthers in front to start overtime, but Herbert scored on a rebound to tie it. Threes by AbbyRae Wells and Kami Kozubal put the visitors up 55-51, but again the host came right back. Cheung had an offensive rebound to cut the lead to two and then Brown also scored with a putback to tie the game. In the excitement after the tying basket, Sharon made a critical mistake. The Eagles fouled Dzindolet with 7.5 seconds remaining and sent her to the line for a pair of free throws. Dzindolet made the first and Elisma had a chance off the missed free throw to get out and run. There was no call on the final attempt and the shot came up short. Sharon (2-8, 1-5) will try to bounce back on Tuesday when it hosts Stoughton. Sharon athletic director Dr. Nicholas Schlierf announced last week that the school has hired former Rockland High assistant coach and current Duxbury High softball coach Sandra Lombardi as the new girls’ basketball coach, replacing Cliff Tomassian, who stepped down this summer after three seasons. This is the first varsity basketball coaching position for Lombardi, who has coached at the sub-varsity level for a number of years, including at Cardinal Spellman, East Bridgewater (her alma mater, where she became interim varsity coach in 2015-16 after the head coach stepped down during the season), and last season at Rockland. While this is Lombardi’s first time at the helm of a basketball program, she boasts an impressive coaching resume in softball. She was the coach at Whitman-Hanson and led the Panthers to 13 state tournaments in 15 years before two seasons at Massasoit Community College, before taking her current position at Duxbury. The Eagles have a potentially young roster. Lombardi said that only one senior is returning this winter, guard Miranda Cheung, who was part of the hiring committee for the new coach.